The Washington Confederate Cemetery in Hagerstown, Maryland, part of Rose Hill Cemetery, is the final resting place of Confederates who died in the Maryland campaigns of the Civil War. The names of those buried there is uncertain for a number of reasons. In 1869 Governor Bowie requested Thomas Boullt of Hagerstown, Maryland, one of the Trustees for Maryland at the Antietam National Cemetery where the Union dead were buried, employ agents to go over the battlefield and mound up the trenches and graves of the Confederate dead, to make careful notes of the locations and, as far as possible, to identify the dead. A descriptive list of the burial places of the remains of Confederate soldiers, who fell in the battles of Antietam, South Mountain, Monocacy, and other points in Washington and Frederick counties, in the state of Maryland, also known as the Bowie List and on this website, was researched by two Sharpsburg men, Moses Poffinberger and Aaron Good, hired by Boullt. They listed 758 identifiable remains, and 2,481 unknown. Included were many buried in Frederick County, not just from the battles along South Mountain, but also Buckeystown, Middletown and Mount Olivet Cemetery in Frederick. Many of those who were buried in Mount Olivet Cemetery, 265 named and 158 unknowns, were probably killed in the Battle of Monocacy, July 9, 1864. 122 were brought to the Cemetery on Saturday, of whom only the eight following were recognized: M. Grubne, Co. C, 16th Georgia; Benj. Mathews, Co. F, 16th Georgia; E. H. A., Georgia; Capt. N. Reeder, Co. H, 16th Georgia; Wm. Smith, Co. B, 16th Georgia; Thomas Hobbs, Co. K, 16th Georgia; Thomas Sander, Co. G, 10th Georgia; Dr. Braddock, S. C.
(These men were all listed on page 81 of the Bowie List, as “Buried close along the fence on west side of woods back of graveyard in Burkettsville”). The trustees of Washington Confederate Cemetery never provided individual grave markers for the reinterred soldiers under their care. Initially, the trustees lacked funds to do so; later, when it became apparent that a large percentage of the bodies could not be identified, perhaps it seemed inappropriate to mark the few whose identities had been preserved ( Maryland State Archives). The next list to survive was produced in 1888. Joseph Coxson (also spelled Coxon), the first superintendent of Rose Hill Cemetery, received $5.00 from the Trustees of Washington Cemetery on May 30th 1888 “for making map of burial”. It is this map on the metal plaque at the cemetery today. While many of the names of men buried on or near at the battlefield, according to the Bowie list, appear also on Coxson's list, names of men buried elsewhere, for example the Hagerstown Almshouse or Mrs. Hoffman's farm in Boonsboro, listed in the Bowie list and also in the Herald and Torch Light, are not found on Coxson's list. Sam Pruett, a long-time Trustee of the Washington Confederate Cemetery and member of the Hagerstown Civil War Roundtable, noted in a Morning Herald interview in 1984, "We're trying to compile a master list of all the people who are buried there," Pruett said. "It's sort of a continuation of our love of history." It is his list that is included here. It appears that Pruett took Coxson’s list and checked it against the list produced by Poffinberger and Good. Then he added data from the Compiled Service Records for Confederate soldiers from the National Archives and Records Service (now NARA) and from A List of the Sick and Wounded Confederate Soldiers left at Williamsport and Hagerstown, Md. after the Battle of Gettysburg, from July 13 to August 12, 1863 as kept by Dr. J. M. Gaines, surgeon 18th Va. Inf. From this Sam Pruett noted that a number of men on Coxson’s list were also listed as buried in Mount Olivet. (In fact, 35 of those currently listed in Mount Olivet are also listed on the plaque at Washington Cemetery). Coxson’s list includes 353 names, but Pruett shows Compiled Service records for only 107 of them, and 16 of these records show that the Confederate was buried at Mount Olivet. Determining who is buried in the Washington Confederate Cemetery remains an almost impossible task, despite the best efforts of many researchers. While records from the state pension offices clarify who died at Antietam or South Mountain, there is no guarantee that these men were reintered in the Washington Confederate Cemetery. Pruett's research has however added to the knowledge of those who may not be there. 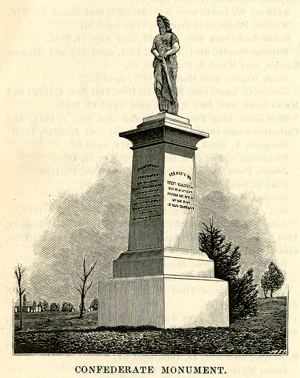 This website includes Sam Pruett’s research, the record of expenditures of the Washington Confederate Cemetery, newspaper articles listing names of persons Henry Mumma brought to be reintered in 1874 and Thomas Scharf’s history of the Washington Confederate Cemetery with Pruett’s notes. It also includes a document compiled using all of the Poffenberger and Good’s register, Coxson’s names, Pruett’s Compiled Service records, and where they overlap, the records from Mount Olivet. A separate report of all of the names of these believed to be buried in Mount Olivet is also included. Western Maryland Regional Library is grateful to Sam Pruett for his research, and to his family who gave this material to the Western Maryland Room at the Washington County Free Library. Additional gratitude is expressed to Greg Farino of Riverview, Michigan, who provided the records of soldiers killed at Antietam and South Mountain, the list of Confederates buried in Mount Olivet and made suggestions for names on the Bowie list.